Cabbage white butterflies fly from February until mid-November. They are among the first butterflies you see in spring, and among the last you see in fall. Cabbage whites are found in fields, gardens, parks and roadsides all over the world. They begin mating by the time they're 2 or 3 days old. Tail-to-tail copulation takes several minutes, as the male passes sperm packets to the female. Female cabbage white butterflies choose a host plant and place their oblong white or cream-colored eggs singly on the underside of a leaf. Host plants are usually members of the mustard family, including cabbage, cauliflower, broccoli, radishes, horseradish and nasturtiums. The length of time it takes for the eggs to hatch depends on the temperature. Most eggs hatch four to eight days after being deposited on the host plant. Cabbage white larvae, called cabbage worms, are green with five lengthwise yellow stripes, and are covered with short fine hairs. After hatching, larvae feed on the underside of their host plant's leaves during their first week, and feed from the topside during their second week. Cabbage worms grow to three-quarters of an inch long and molt five times before entering their pupal stage. Crops are unmarketable after a cabbage worm infestation. The cabbage worm grows so fast, he outgrows his exoskeleton and needs to molt during the larval stage. The cabbage worm chooses a dry spot on the host plant to molt. He spins a silk covering with a silk gland located below his jaws, attaching himself to the plant. His exoskeleton splits open, allowing the larva to crawl out. About 2.5 weeks after hatching, the cabbage white larva begins to pupate. He attaches himself to the underside of a leaf or stem and spins a silk pad. The cabbage worm spins silk strands to attach himself to the silk pad. A brown chrysalis forms inside the exoskeleton. An outline of the wings appears during the first few days. Two dark wing spots will appear about 24 hours before emergence. Pupae can hibernate during winter while attached to the host plant. In warm weather, emergence occurs 30 to 45 days after the egg hatched. The cabbage white butterfly changed from a caterpillar to a butterfly during this time. His chrysalis splits open and the adult butterfly emerges. He pumps up his wings, then rests while they dry, before flying off to begin foraging. Adult cabbage white butterflies have a 2-inch wingspan. Their wings are mostly white, with charcoal gray tips on their fore-wings and pale yellowish-green on the undersides. Female cabbage whites have two black spots on each fore-wing, and males have one. Both sexes have a black spot along the outer edge of each hind-wing. 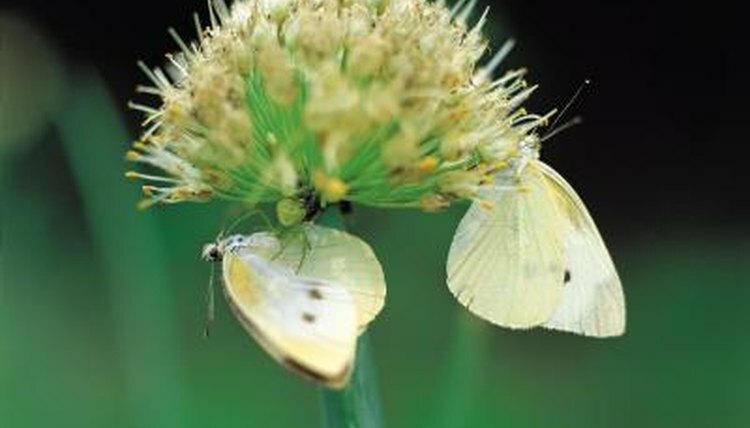 Adult cabbage white butterflies pollinate plants as they feed on nectar from many flowers, including dandelions, red clover, asters, mint and strawberries.